Overlooking the sea from the heart of Whitley Bay, this 3-star hotel with free parking is close to all amenities and the Metro station. Situated on the seafront promenade, the hotel is well located for exploring the cultural heritage, countryside and coastline of the north east of England. Many of the rooms have a sea view. The lounge bar and restaurant serves English dishes, and the hotel is connected to a nightclub. Private dining can be organised and conference facilities are available. In the heart of Whitley Bay, this friendly, family-run bed and breakfast is close to the seafront, shops, pubs and clubs and the metro station, for easy access to Newcastle's vibrant city centre. The Aald Northville has a convenient, central location, close to all that this seaside town has to offer, including all of the trendy bars, great pubs and lively nightclubs. The good location also means that the bed and breakfast is close to local bus routes and is just a few hundred metres from Whitley Bay Metro Station. Trains run regularly from the station to Newcastle's city centre, with a journey time of just 25 minutes. Most of the rooms are en suite and all of the rooms have tea/coffee making facilities and Sky TV. Free Wi-Fi is available throughout the building. Privately run, the Aald Northville prides itself on offering a hearty full cooked English breakfast and a warm welcome to all. 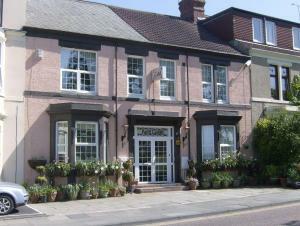 We are a popular guest house in the heart of Whitley Bay, close to the sea front and all local amenities. Our family run hotel offers the best in quality affordable accommodation with that personal touch. Located in an ideal position 2 minutes away from Whitley Bay's sea front, and the centre of Whitley Bay. The Esplanade Lodge is also in an ideal position for the large variety of Whitley Bay nightlife and local attractions. All rooms are furnished to the highest standards: En-suite facilities, colour TV in every room and complimentary hospitality trays. Room types available are single, twin/double and family. Situated in the heart of this popular seaside resort, the hotel is a short walk from the beach and close to all amenities and nightlife. Our friendly hotel caters for a wide variety of guests from contractors working away from home to the ever popular stag and hen parties. The hotel has its own bar on the main street, hosting a resident DJ 3 nights a week and a variety of other events to make your weekend enjoyable. Whitley Bay is a lively seaside resort, only a 10 minute drive from Newcastle city centre. In a quiet location just minutes away from Whitley Bay town centre. Family run for over 20 years, Oaktree Lodge has a great reputation for quality and service. Modern guest rooms are non smoking with en suite showers, LCD TV (Freeview) and free Wi-Fi. Oaktree Lodge has a modern bar/coffee lounge with high-speed Wi-Fi internet access and a large plasma-screen TV. In a quiet location just minutes away from Whitley Bay town centre, the lodge is very popular with families and business/leisure guests. Oaktree Lodge does not accept bookings from stag or hen parties. About a mile south of the town. Directly overlooking the Northumberland coastline, The Park Hotel Tynemouth offers free parking, free WiFi and impressive sea views. Situated in Tynemouth village, The Park Hotel is just 10 minutes from Newcastle town and the Metro Centre, and a short drive from the castle and village at Warkworth. The Blue Reef Aquarium and Tynemouth priory are also close by. The on-site Parkers bar and restaurant serves a variety of meals, and has a terrace overlooking the beach. Meeting rooms and conference facilities can also be arranged. All rooms at the Park Hotel are en suite and provide tea and coffee making facilities. Most rooms also have sea views, and there is a 24-hour front desk. This family-run guest house with free Wi-Fi offers bed and breakfast accommodation overlooking Whiteley Bay Park and 400 metres from the sandy beach. York House Hotel has free on-site car parking and en suite rooms with fridges and microwaves. 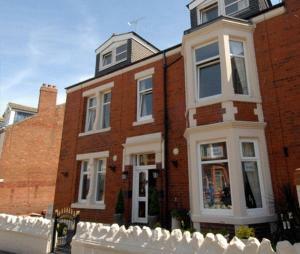 The York House has a quiet location in the centre of Whitley Bay. The restaurants, bars are only a short walk from the hotel. Whitley Bay Metro Station is 700 metres away, and all areas of Tyne & Wear are within easy reach. Newcastle city centre is 15 minutes from York House Hotel. Overlooking the seafront of Whitley Bay, The New Royal Hotel offers refurbished en suite rooms and stunning sea views. There is also an on-site restaurant and bar. Most of the Quad and Triple rooms at The New Royal Hotel look out over Whitley Bay, with views of St Mary's Lighthouse. Free Wi-Fi is available in every room. The New Royal Hotel is a short taxi ride from the Newcastle city centre, and is close to Durham and Tyneside. The New Royal has free parking. In a central location on South Parade, Newquay Lodge Hotel has en suite rooms featuring free Wi-Fi, TVs and tea/coffee facilities. There is a free private car park. Newquay Lodge has an impressive refurbished bar and lounge area. The Lodge is a short walk from the beach and close to all amenities and nightlife. In the coastal town of Whitley Bay, Newquay Lodge features Sands Bar, the popular Hairy Lemon Bar and San Carlos Italian restaurant. Complimentary soaps and shampoos are provided in all bathrooms. Newcastle is only 8 miles away and is easily accessed by car as well as being well served by public transport (bus and Metro). Sunholme Guest House is a family-run property in the Whitley Bay area, 2 minutes away from the seafront and within walking distance of clubs and wine bars. Rooms at Sunholme have a flat-screen TV with Freeview channels and a DVD player. There is also a local information pack and tea/coffee making facilities. Ironing facilities are available on request as well as packed lunches, and all guests have access to free Wi-Fi. Sunholme Guest House is only 30 minutes from Newcastle City Centre and the Metro Centre. For Bed and breakfast accommodation in other areas near to Whitley Bay, Tyne and Wear see bed and breakfast in Newcastle u Tyne & bed and breakfast in South Shields.